THE Olivier-award winning best new comedy of 2019, Laura Wade’s Home, I’m Darling, comes to Bath Theatre Royal direct from the West End for an Easter week run from Tuesday 16th to Saturday 20th April, the start of a three venue national tour. The National Theatre and Theatr Clwyd’s critically acclaimed co-production, directed by Tamara Harvey, has delighted both audiences and critics. Every couple needs a little fantasy to keep their marriage sparkling, and you can’t be sure what’s going on behind the gingham curtains. The happily married might not be as happy as they seem when things start to unravel. Being a domestic goddess is not as easy as it seems. 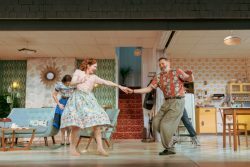 Olivier best actress nominee Katherine Parkinson plays Judy in this fizzing comedy about one woman’s quest to be the perfect 1950s housewife. Susan Brown, who plays Sylvia, was nominated for an Olivier for best supporting actress. Jo Stone-Fewings plays Johnny, with Siubhan Harrison as Fran and Hywel Morgan as Marcus. Sara Gregory reprises the role of Alex, which she played at both Theatr Clwyd and the National Theatre in 2018 and in the West End in 2019. Playwright Laura Wade, who studied drama at Bristol University, has written Posh for the Royal Court, adapted into the film The Riot Club. One of her early works was Colder Than Here, about coming to terms with death, which was toured around the Dorset and Somerset area. Performances are at 7.30 each evening with 2.30 matinees on Wednesday and Saturday.